Innovative and versatile, this protective jacket made of GORE-TEX THERMIUM 2L is waterproof and provides warmth. 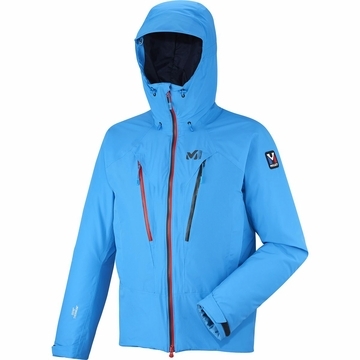 It is designed for the keen mountaineer looking for a watertight protection with an excellent warmth-to-weight ratio. The secret is a waterproof membrane and dual material insulation. The combination of merino wool and Primaloft insulation offers a high degree of thermal regulation and breathability while the polyamide ripstop shell provides resistance. The natural wicking properties of wool will keep you dry while the insulation traps warm air inside. The ergonomic design will free your movement and boost your performance on alpine ascents. This all-new exclusive Trilogy design offers versatility.